WASHINGTON -- Loretta Lynch was sworn in Monday as the 83rd U.S. attorney general, the first African-American woman to serve as the nation's top law enforcement official. Speaking before family members, Justice Department lawyers and supporters, Lynch said her confirmation as attorney general showed that "we can do anything" and pledged that the agency would "use justice as our compass" in confronting terrorism, cyberattacks and other threats facing the country. "We can imbue our criminal justice system with both strength and fairness, for the protection of both the needs of victims and the rights of all. We can restore trust and faith both in our laws and in those of us who enforce them," Lynch said, an apparent reference to ongoing efforts to repair relations between police departments and minority communities that they serve. 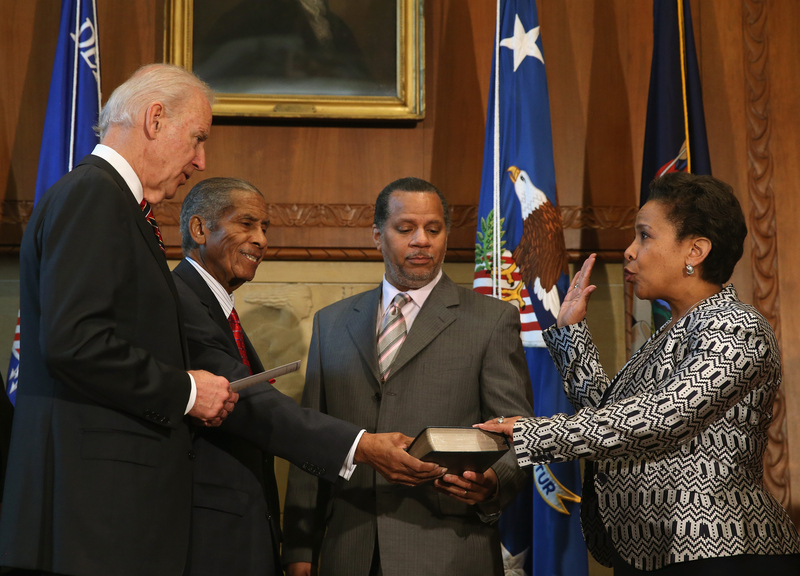 Vice President Joe Biden administered the oath of office to Lynch at a Justice Department ceremony, calling Lynch an "incredibly qualified" selection. He said Lynch had shown grace during the months-long confirmation process, in which her nomination became caught up in Congress a dispute over human trafficking legislation. The 55-year-old Lynch was confirmed by the Senate on Thursday. She replaces Eric Holder, who left the position Friday after serving as attorney general for six years. "Ladies and gentlemen, it's about time - it's about time this woman is being sworn in," Biden said to applause. She was previously the U.S. attorney for the Eastern District of New York, which encompasses much of New York City, and is expected to serve as the top federal law enforcement official for the remainder of the Obama administration. Lynch isn't expected to make radical departures from Holder's agenda, but has said she hopes to have a productive relationship with Congress. Holder frequently clashed with Republicans on Capitol Hill and was held in contempt during a document dispute stemming from the Fast and Furious federal investigation into gun trafficking. The Harvard-educated Lynch grew up in North Carolina during the civil rights movement of the 1960s, the daughter of a librarian and a fourth-generation Baptist preacher who Biden said would take his child to the courthouse to observe important cases. "I am here to tell you, if a little girl from North Carolina who used to tell her grandfather in the fields to lift her up on the back of his mule, so she could see `way up high, Granddaddy,' can become the chief law enforcement officer of the United States of America, then we can do anything," Lynch said.